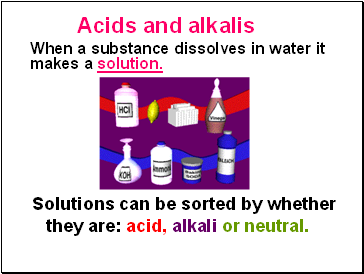 To know that solutions can be sorted by whether they are: acid, alkali or neutral. 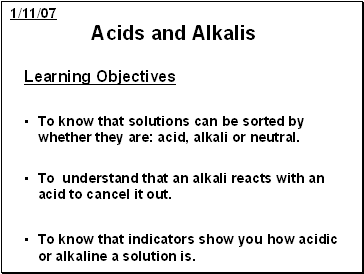 To understand that an alkali reacts with an acid to cancel it out. To know that indicators show you how acidic or alkaline a solution is. Lemon juice contains citric acid, and vinegar contains ethanoic acid. 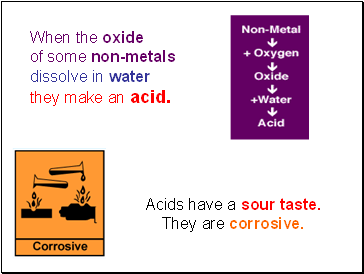 Some strong acids are hydrochloric acid, sulphuric acid and nitric acid. 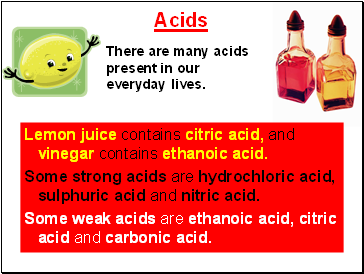 Some weak acids are ethanoic acid, citric acid and carbonic acid. There are many acids present in our everyday lives. 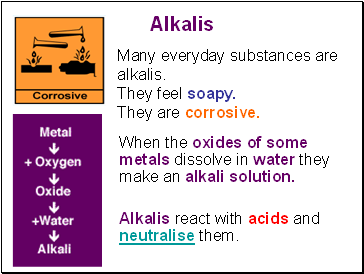 Acids and alkalis react with each other. The alkali cancels out the acid in the reaction. This is called neutralisation. 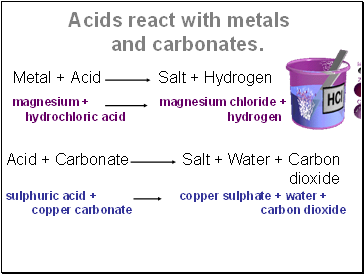 The salt made depends on the acid and alkali used. The salt contains the metal atom from the alkali, and part of the acid molecule. The salts of sulphuric acid are known as sulphates. The salts of hydrochloric acid are known as chlorides. 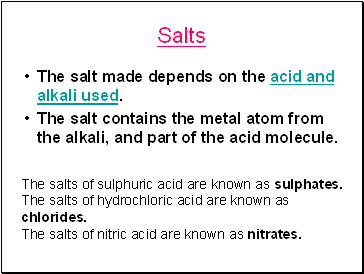 The salts of nitric acid are known as nitrates. When the oxides of some metals dissolve in water they make an alkali solution. 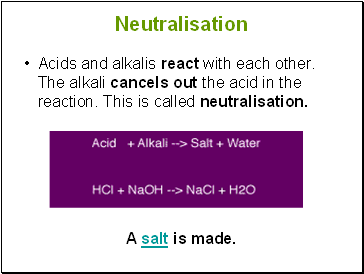 Alkalis react with acids and neutralise them. Many everyday substances are alkalis. 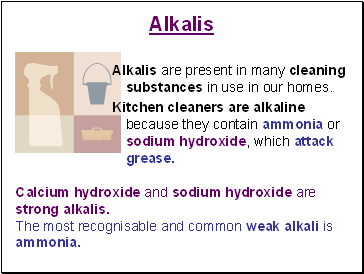 Alkalis are present in many cleaning substances in use in our homes. Kitchen cleaners are alkaline because they contain ammonia or sodium hydroxide, which attack grease. Calcium hydroxide and sodium hydroxide are strong alkalis.